Whatever type of car you own, and whether you drive it through a car lease or contract hire agreement, bad weather conditions make the roads more hazardous. With winter here, drivers are faced with fog, ice, snow and rain as well as the prospect of more driving in the dark. To help to keep drivers safe, a leading UK road safety charity has published advice for motorists about staying safe in bad weather. Brake has published advice through their Fleet Safety Forum to help drivers manage difficult conditions, including an easy to remember ABC of measures. Keep reading to find out more. 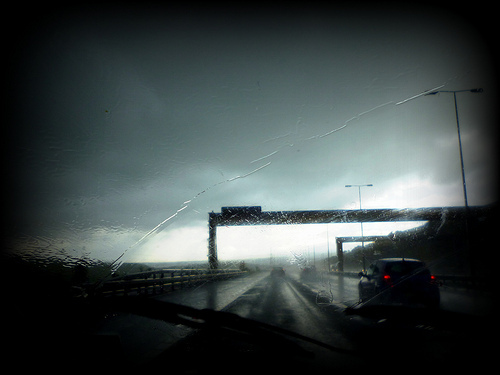 Road safety charity Brake, in conjunction with Arco, has published advice for drivers on keeping safe in bad weather. The resource is available for fleet managers to distribute to their drivers through the charity’s Fleet Safety Forum. Adverse weather conditions can make driving much more dangerous. And, Brake say that at this time of year, it is vital that companies employing drivers take extra steps to manage the risks and remind drivers of the dangers. As well as company car and contract hire drivers, it is also important that you follow the advice if you are a private car lease customer or you own your own vehicle. Figures show that during 2007, in the UK alone there were 369 people killed, 3,910 people seriously injured, and 24,771 people slightly injured due to car crashes involving inclement weather. Different weather conditions can have different effects on your driving. For example, stopping distances double in the wet and can increase tenfold in ice and snow. Fog or dazzling, low sun can severely harm visibility, preventing drivers from reacting to hazards. And, flooding and strong winds can make even familiar roads treacherous. Thomas Martin and Neil Jowsey, Joint Managing Directors from sponsors Arco said: “With the winter weather on its way, we’re encouraging drivers to be prepared for the challenging weather. This entry was posted in Advice and Guides and tagged bad weather, bad weather driving, prepare for winter, winter driving, winter driving advice, winter driving tips by David Petherick. Bookmark the permalink.